At the same time of year when kids can’t sleep the night before school, ready to start a new year of learning with sharpened pencils and brand-new notebooks, social good professionals are restless awaiting their annual learning deep dive at Blackbaud’s social good conference, bbcon. 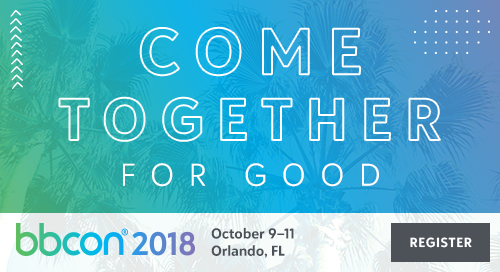 One of the only conferences to attract attendees from across the social, private and public sectors, bbcon is a convening of professionals where tech innovation, collaboration, and forward-looking insights are encouraged. Below are a few of the themes you can expect to see at bbcon, and we hope to see you there! As one of our speakers, John Hancock’s Annie Duong-Turner, reflected when discussing their grants program: if you want to create long-term impact, you can’t do it alone. Cross-sector partnerships can help to create solutions that address the root of a problem, sourcing expertise and other resources from those best suited to solve certain issues. At bbcon this year, we’re excited to host numerous panels that stress the importance of such collaborations. From cause marketing with Catalist, to multi-faceted partnerships with Social Capital, and corporate philanthropy with World Wildlife Fund, Royal Caribbean and others, we have multiple perspectives and use cases for you to learn from during the three days in Orlando. Technology has transformed the philanthropic community, and as the world’s leading cloud software company powering social good, we would know. As demands for reporting, transparency, and outcomes-driven initiatives grow, hear how customers have reimagined the possibilities with their technology. Plus, understand what blockchain really means for your processes, and hear action steps you need to take to lock in data privacy and security. Or really, what you need to be asking for from grantees and partners to ensure your information remains secure. A key contributor to this digital transformation is the availability of data that can detail the true outcomes of philanthropic efforts, versus just inputs or outputs. Data can be segmented and manipulated in many ways to communicate your story appropriately to each target audience, to achieve the desired result. Data is a tool that can be pivotal in evaluating new cause partnerships, partners for employee giving programs, or planning employee assistance programs. We’ll specifically explore the latter as it relates to disaster relief at bbcon, an area that continues to affect companies with employees across different geographic areas throughout the entire year. Learn more here, and we hope to see you in Orlando, October 9-11 for the latest CSR trends, tech innovations, and collaboration opportunities!